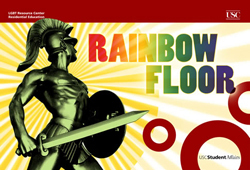 The USC Office of Residential Education’s Rainbow Floor (est. 2001) is a special interest residential community for LGBTQ+ students; it is located in the USC-owned Century Apartments complex, just across the street from campus. The Office for Residential Education sponsors community-based programming here that allows students to learn more about themselves and their LGBTQ+ identities and make meaningful friendships. The USC LGBT Resource Center, in partnership with Residential Education, assists in approval and placement of Rainbow Floor residents. On the Rainbow Floor, students can room with friends regardless of sexuality or gender identity as all of the apartments are gender-inclusive. All students, except first-year students, are welcome to apply for the Rainbow Floor.